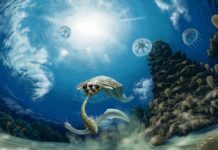 The most recent era in Earth’s timeline is the Cenozoic Era – an era which literally means “New Life.” It is an era which spans 65 million years till the present and is often called by paleontologist the Age of Mammals. That’s because this is the period on the geological time scale in which mammals moved into the niches that were opened up after the K-T Extinction and began to thrive on a global basis. However, it is also somewhat of a misnomer because mammals weren’t the only species of animals to thrive in this new environment. Birds, insects and flowering plants also have had their day in the sun and have not only thrived but have also diversified. This era can be subdivided into three distinct periods. These periods are the Paleogene Period, the Neogene Period and the Quaternary Period. These three periods can then be further subdivided into seven epochs. These seven epochs include the Paleocene, the Eocene, the Oligocene, the Miocene, the Pliocene, the Pleistocene and the Holocene. This era is broken down into so many subgroups because it helps scientist organize the data of this relatively short period. 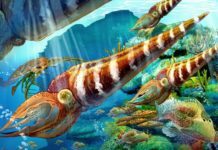 The first period of the Cenozoic Era was the Paleogene Period and it began approximately 66 million years ago and ran until about 23 million years ago. During this time, the Earth was beginning to recover from the utter destruction of the K-T Extinction. 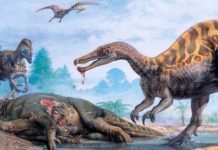 It was also a period when the continents began to take their shape, when small mammals began to evolve in the jungles and when some mammals began to become huge. The epochs contained during this era include the Paleocene, the Eocene and the Oligocene. The Paleocene Epoch ran for about 10 million years – from 66 million years ago to 56 million years. It was during this period that the Earth was truly trying to recover. It was also the period when the continents separated from each other and the planet began to warm. This led to a great expansion of the jungles; Some of the jungles even managed to stretch as far as the poles. In the oceans, the large aquatic reptiles had died out and their niche was occupied by sharks. Mammals continued to evolve but none of the were over 10 Kilograms – or about 22 pounds. 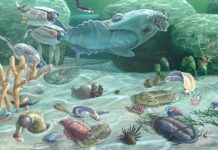 The Eocene Epoch began 56 million years ago and ended 33.9 million years ago. Mammals continued to evolve during this period and they continued to stay small. During this time, early primates, horses, and whales began to evolve. Sitting on the top of the food chain was birds, the only time non-dinosaur birds would occupy this top niche. Thanks to a disrupted flow of the Antarctic Circumpolar Current, the Earth began to cool. This caused the jungles to recede and allowed mammals to begin to grow larger. Some of them, in fact, were able to reach gigantic proportions – like whales, for instance. 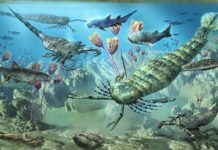 The Oligocene Epoch began 33.9 million years ago and ended 23 million years ago. During this time period, grass began spreading all over the planet, thanks to the recession of the world’s jungles. This allowed many new species to evolve. Some of the species which evolved during this time included cats, dogs, marsupials, and elephants. However, grass wasn’t the only plant species to thrive during this time. Evergreen trees also found their niche and began expanding all over the world. As this epoch wore on, mammals would continue to get larger. The next period of the Cenozoic Era was the Neogene Period and this period ran from 23.03 million years ago to about 2.58 million years ago. It can be subdivided into two major epochs. These epochs include the Miocene Epoch and the Pliocene Epoch. This period saw the rise of a variety of different animals include Bovids, large predatory mammals, and early primates. During the Miocene Epoch, which ran from about 23 million years ago to 5.3 million years ago, the gigantic jungles and some of the forests of past eras began to recede and grass gradually began to replace them. Many species of mammals began to evolve and these included sea otters and apes – which continued to branch off into many different species. Seed plants also began to thrive during this epoch with over 90% of modern seed plants evolving during this time period. The Pliocene Epoch started 5 million years ago and ended about 2.58 million years. 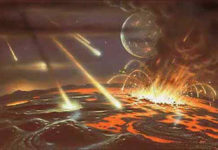 It was during this time in Earth’s history that the planet was going through dramatic climate changes. It was also the time when Australopithecus evolved in Africa – which would be the beginning of the human species. And finally, the continents of the world moved into their present configurations. The last period in the Cenozoic Era was the Quaternary Period that runs from 2.58 million years ago to the present day. During the Pleistocene Epoch (2.58 million years to 11,700 years ago), four separate glaciations began during this time. It was also during this epoch that Africa began to lose water, which led to the development of the Kalahari, Namib and Sahara deserts. Animals such as saber-tooth tigers, cave lions, giant sloths and dire wolves evolved during this time. Homo sapiens continued to evolve and thanks to the end of a drought in Africa, began to expand across the globe thanks to land bridges. By the end of this epoch, a major extinction struck which killed many of the giant animals of the time. The Holocene Epoch began 11,700 years ago and continues to this day, making it the current epoch of the Quaternary Period of the Cenozoic Era. During most of this time, the climate has been pretty stable and the human species has spread worldwide – wielding science and technology to take over the world and developing art, music, and poetry along the way. What does this epoch hold in store for mankind? No one knows for sure but it’s bound to be a fun ride that is sure to bring even more changes. After all, the Earth is always changing.